What are chiropractors checking for before they actually administer an adjustment? The answer is a vertebral subluxtion. In order to even know specifically how and where to be adjusted. You need to have your spine checked for inflammatory processes, muscles imbalances, and continual analysis of the x-ray images. Superficial changes along the spine can occur randomly. X-rays are the ultimate objective analysis for the Gonstead Chiropractor. Data from the environment, both external and internal, goes through the spine to get to the brain. As well as, data and decisions made in the brain go through the spine to affect certain outcomes in the body. It is a two-way flow of information that is vital for you to function in life. A vertebral subluxation is the result of spinal bones with improper motion that CAUSE disruptions or distortions of the nerve communication. Thus resulting in an inability to fully express health, proper function and overall your true potential. Subluxation’s will cause dysfunction within our bodies that we are not aware of. Our body will begin to give us warning such as signs and symptoms. We overlook these signs and symptoms and begin to think they are a “normal” way of life for us. Your bodies potential diminishes and your overall ability to function is weakened due to the vertebral subluxation. With our underlying CAUSE being a vertebral subluxation the signs and symptoms will continue to flourish unless the proper course of action is taken. If your master control system (the nerve system) is healthy and functioning at 100%, then your other systems under its control will also function at 100%. The same innate intelligence that can grow a single cell into a complex human being, made of billions of cells, can also heal the body if it is free of interference or disturbances to the nervous system. A subluxation will inhibit your body to heal and for you to express life the way you want. Getting checked for the presence of vertebral subluxation is the value you put on your life. A healthy nervous system is the foundation for a healthy life. Think of a subluxation as disconnecting the power source. Imagine a light switch. Now imagine a switch that has the capacity to dim. 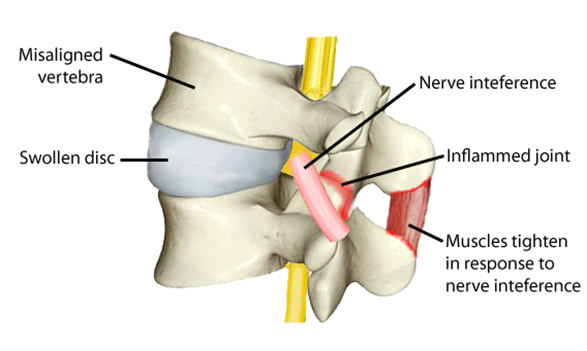 When a subluxation occurs within the spine the nerves automatically become dysfunctional. The nerves do not have the proper power source and actually are working harder in a “dimmed state.” This is when the lights begin to dim. It’s like pulling out a cord from the outlet ever so slowly. For years you can function like this, you can still read and do anything you want to when the lights are dimmed. You do not perceive anything as a problem because you begin to think that the lights are always dimmed. The same thing happens within your body when a subluxation is present. Your body becomes dysfunctional over time and symptoms begin to appear. These symptoms begin to become “normal” for you. Typically pain will be the last symptom that your body will express as a problem. When the dimming of the lights is finally noticeable is when pain shows up. When in reality your body was giving you messages all the time that something was disconnected. Nerves are your bodies way of open communication. Just think how you receive a heartbeat every single second of your life. Nerves! Nerves send electrical messages that release hormones that initiate a heartbeat. Then, immediately after a heartbeat other nerves send electrical messages to allow the heart to heal and get ready for the next heartbeat. This is all controlled automatically via the brain to the nerves. This has been happening even before you were born. Neat! As a Gonstead chiropractor we are trained to perform our chiropractic evaluation that will allow us to detect and correct the specific cause and return your power force on!